The 2nd annual Kevser Ermin Memorial Lecture in University’s of Mississippi’s Health and Kinesiology program is set for Thursday, April 9th at the Turner Center Auditorium (room 205). 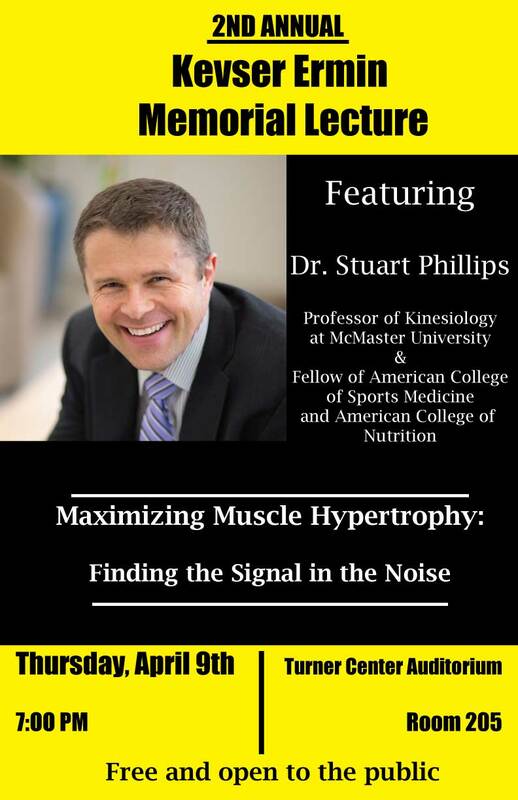 Beginning at 7 PM, the lecture will feature Dr. Stuart Phillips, professor of kinesiology at McMaster University and fellow of the American College of Sports Medicine and American College of Nutrition. The event is free and open to the public. Phillips’ lecture is titled “Maximizing Muscle Hypertrophy: Finding the Signal in the Noise.” An internationally recognized expert in the field of muscle physiology, Phillips has published on the topic in journals such as Journal of Applied Physiology, American Journal of Physiology,and Sports Medicine. The lecture series is dedicated to Kevser Ermin, a doctoral student in the Health, Exercise Science, and Recreation Management. An accomplished academic, athlete, and volunteer, Ermin is remembered for her tragic death while cycling near Oxford in October 2011.